[XPB-S53-X] DISCONTINUED The Commercial Water Saving Hand Sink Air Metering Faucet has a light-touch operating system and an automatic shutoff with a consistent 10-second operating cycle. 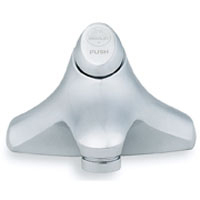 This faucet is ADA Compliant and comes with a replaceable metering valve cartiridge. Constructed of chrome-plated, solid cast brass, this faucet is vandal resistent.Discount Sale Prices.